Human society has been decimated by a holocaust caused by biological warfare research gone wrong: instead of creating super-soldiers, a genetically-engineered virus turns infected humans into Hemophages, a vampire-like sub-species with enhanced physical abilities. In the infection-paranoid and technologically advanced society that follows, Violet is a singular Hemophage warrior battling the totalitarian dictator who is determined to wipe out her species at any cost. Download Ultraviolet in Digital HD from the iTunes store. Ultraviolet images are © Screen Gems. All Rights Reserved. I gave Munich a hard time. 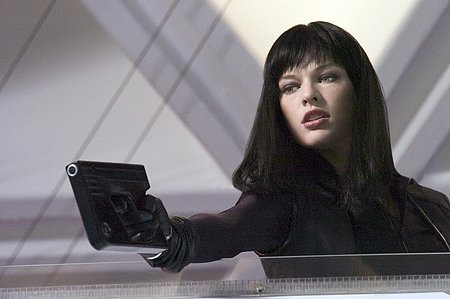 I loved Ultraviolet. Either the world is just not fair or I have bad taste. I know what you're thinking: "It's the taste one, Marco"--but let me give you a little test, there, spanky: Call and ask your mom if the world is fair. I'll wait. You can get back to me. Ultraviolet is, unabashedly, a comic-book movie. No, there is no real UV comicbook despite the various geners of UV comic shown durring the credits. It is, however, shooting for the same vibe: primary colors, not-quite-convincing iconic CGI (the bio-weapons lab looks like a giant complext in the shape of the Biohazard spider). The action is way over the top. Evil nasty, quasi-religious global-health-overlord Ferdinand, wages a dirty (yet, paradoxically, very hygienic) war against the vampires (those infected with the hemophage virus) who move like the guys from Equilibrium, act like the homeless people from Bladerunner, and have advanced technology and high-altitude "bomber planes" despite having the social-infrastructure of a street gang. The ultimate weapon of the hemophages is Violet, a woman who Lost. Her. Child. (forced abortion by evil-state when she was infected). 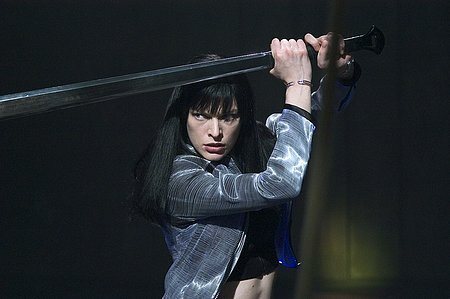 She has super-reflexes, super strength, hair that changes color, is totally hawt, and carries a katana. And guns. But she has a katana. When she gets her hands on the "ultimate weapon" that Ferdinand has created, it turns out to be a character and her maternal instincts kick in and she protects it and seeks revenge for it. Finally, push comes to shove and she kills a whole lot of people. 1. In the future, the meaning of the word "Vampire" has been soddomized to near non-existence. You get infected. You get teeth. You get strong and fast. You're "dying." You need transfusions. If you bleed on someone they become a vampire. Or something. Apparently vampires who want to infect people have a hard time doing so and need to break into giant bloodbanks or something. And yet. One drop of vampire blood and people are infected. WTF? Who cares--Munich was supposed to make sense. Ultraviolet was not. 2. There is shockingly high technology. Rooms fold up inside other rooms. You can drive on the walls. You can demateralize weapons. This is all, actually, very cool. Let me tell you the coolest part though: Violet needs to make a call so she goes to a vending machine and prints out a paper, disposable cell phone. That's right: a paper (so thin, it folds), disposable (limited use), cell phone. Somewhere a script writer is doing this action scene where Violet, is, again, surrounded at close range by synchronized swimmers with machine guns*, who just. won't. pull. the. trigger. He's going "Yeah! This is so cool! Then you hear the shhhink-sound and they all stand there for a heart beat--and then they fall over! Rocking! Then she rides her motorcycle straight up the wall like Ghostrider." And he thinks for a moment and then goes "And in the future ... I think market drivers will create a super-thin form-factor planned-obselescence cell phone using sub-micon printed circuts that we see being developed for fabric-wearable computing. HEY! I'll put those in my movie too!" 3. Future people know what we, ourselves, will not actually admit: Katanas are cool on some elemental level. If you want to be really bad, you must have both a machine gun* and a katana. If you tell me that UV's straight blade is "not actually a katana" I will advise a regimine of punching yourself in the groin. What would happen if a hemophage and a grammeton cleric fought? Ultraviolet is over-the-top action with helicopters firing chain guns into skyscrapers. Munich has guys with feminine little European automatics shooting bullets into grocery bags. Ultraviolet's hair changes color! Munich has 70's hair. Ultraviolet hits a lot of the wrong notes for its drama (the kid isn't especially loveable, there's a scene where UV explains tattoos on her hands we cannot really see, the movie is so loaded with CGI it often looks plastic, the strategy of UV seems seems to be: I was kinda pissed before and just fought with you--now that I am *really* mad, I'm just going to kill everyone who gets in my way). Munich hits all the right notes with its drama. This leaves us with a naked lesbian assassin drooling blood. Ultraviolet is sometimes smart (paper phones). Munich is always smart. Ultraviolet is often dumb (why do the security forces shoot the wrong kid when, presumably, they want the right one alive). Munich is never dumb. Ultraviolet has a ton of CGI buildings. Munich's message hinges on two CGI buildings. Ultraviolet proves that Dinero in Ronin was right: if you surround your target with gunmen they will inevitably shoot each other. Munich has learned nothing from Ronin. Ultraviolet is 88 minutes long. Munich? 168. Winner: Ultraviolet. Keep trying, Stevie. We know you've got another Jurassic Park 2 in you somewhere. * I do actually know the difference between a sub-machine gun, assault rifle, and machine gun. Sue me. Ultraviolet images © Screen Gems. All Rights Reserved.